…there’s a very easy fix for that. After talking to over 1,000 clients (yes, that number is real) over the last decade, I’ve detected a pattern. If you’re not getting the results you want, you’re probably not “doing marketing wrong”. You’re probably just missing a few key pieces (or you have them, but nobody told you how to do them right). 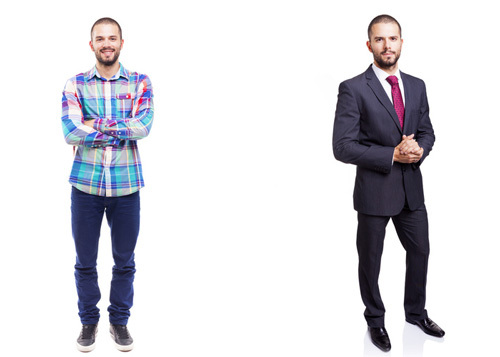 Without these very simple pieces, you’re like a person walking into a networking event without wearing any shoes. Or someone going to a black tie affair… without the tie. “Why is nobody coming over to talk to me?” you wonder. Fix the problem, and things go the way you expect they should. People start talking to you. Many of them will think you’re pretty cool. And then the good things start happening. If you know this one thing about marketing, you're practically set. Marketing is way easier than you think, and has never required magic formulas or expert-level secrets. You want more traffic? More signups? More money? You have to the right pieces in place. I've put together templates that will help you do that, fast. See the guy on the left? Let’s say you had to tell him what to wear for his (conservative!) brothers’ wedding in Chicago. Five minutes, and you’d probably end up with something like what you see on the right. And that would be fine, and it wouldn't take long to put together. That’s what your marketing should be like. The dude on the right is dressed perfectly fine for the occasion. Standard template for a relatively formal event. People will pay attention to him, maybe even complement him on his tie, and treat him like a normal wedding guest. Change one thing, however, and it can all fall apart. Take the guy on the right, and switch out one piece of clothing with the guy on the left, and he will no longer look like he's ready for the event. People will not interact with him in the way he had hoped, because he's missing something. Not because he doesn't look "awesome", but because he looks like he's not really ready for the occasion. Yes, he's dressed. But not like a wedding guest. The same is true with your marketing. If you're missing the core elements - done well - people will ignore you, and they won't take you seriously enough to buy from you. Getting all the important moving pieces in place (the right way) has never been easier. The Ultimate Digital Marketing Template Pack has everything you need to quickly and easily get your website, your email list, and your launches/promotions working the way they should. Get their launches to start making real money. These templates are based on the work I've done for my clients... and they're real-world tested and ready to start working for you. 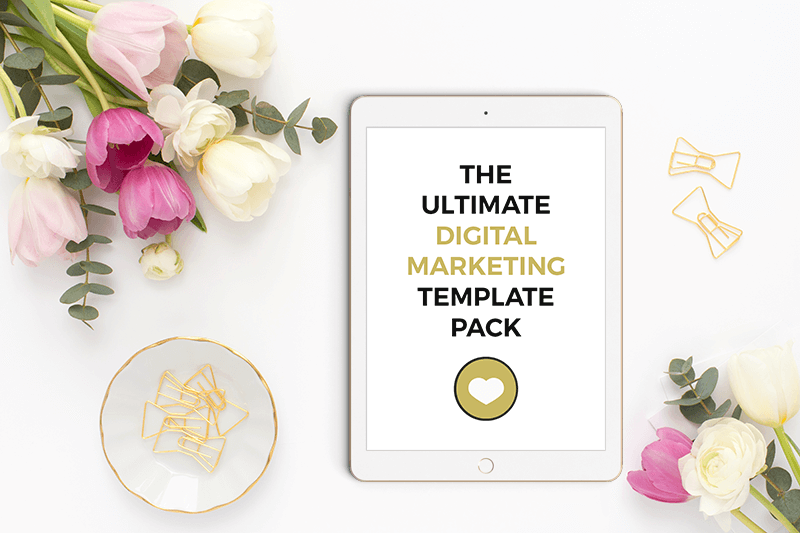 Take a look at what you'll be getting when you download The Ultimate Digital Marketing Template Pack today. Boost your "new visitor page views" by creating a high-converting Start Here page - one of the most effective ways of turning someone who has never heard of you before into a fan. You'll get templates for 5 different marketing-oriented pages that get people staying longer on your site (and signing up for your list). Does your About Page accomplish specific marketing objectives - building rapport, creating positive polarity, increasing requests for initial client calls or helping drive product sales? If you don't know the answer to these questions, these templates will show you how do all that and more - with style and grace. The very first email you send to a new subscriber sets the tone for how they see you for the rest of their time with you - so you want to get this one right. (It's also the single best email for getting them to look at specific pages of your site, like popular posts or product pages). 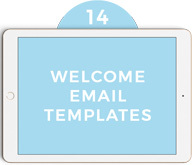 You'll get 14 different templates to show you everything that's possible for this crucial email. What should you be sending out in your newsletters - and how should you lay it out so that people enjoy receiving them? Well, there's no "one" way to do it... but you'll get 7 examples of great newsletter layouts that can get people sharing your content, buying your products, and contacting you for services or coaching. You want more people on your email list. Landing pages are a great way to get them to sign up - but landing page software doesn't exactly tell you how to do it well. You'll get 11 examples of high-conversion landing page layouts (with detailed advice on how to make them great) - so whether you're using landing page software, or making them by hand, you'll know exactly what to do. You give an instant first impression to new visitors by your tagline - so you want to make sure that it does a great job of making your "right people" think you're their "right people". 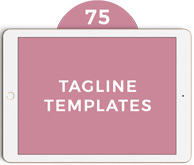 You'll get 75 template taglines - complete with examples of how to use them - and a simple tutorial that will make easy to pick the perfect tagline for you. Launches are simpler than you think - but at the same time, they do take a little finesse. Having run over 85 launches for myself and clients, I've seen enough to know the simple processes that work very, very well. 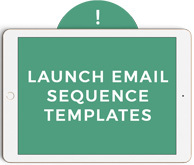 You'll get 5 simple launch process templates - complete with schedules and descriptions of what each email in the sequence is supposed to do - so you can run a launch that doesn't overwhelm you (and still makes great money). Those 5 launch processes above? They come with these templates, which cover every email in every launch process. You can literally cut and paste them if you want, or personalize them to match your particular style. You'll never wonder what to put in a launch email again - from "coming soon" to "last call", you'll have everything you need. Every sales page is different - but the elements that go into a great, high-converting sales page never change. 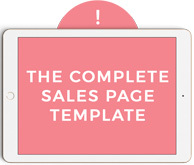 In this template you'll get a complete walkthrough of all the key elements of a long-form sales page. I'll tell you what to do, why to do it, and how to do it right. Use the template as-is, or tweak it how you like - either way, you're set. Do you happily take money to do things for other people? Excellent! You and the Template Pack will get along just fine. 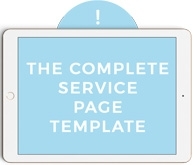 This specialized template will take you through the steps to create a service page that positions you as the expert they will be ready to hire. Everything's laid out and explained inside. 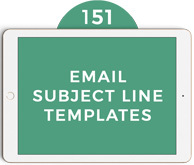 Great blog post titles get people to open your emails, share your content, and sign up for your list. You'll get 195 market-proven templates - with examples for each and every one - so that your content gets all the attention it deserves. (You can use these for any type of content, too - podcasts, videos, products, etc.) If you wish more people would come to your content, you'll love this. There are so many reasons to get the Template Pack – what’s yours? If you’ve spent too much time at a plateau – and you know there are weak points in your marketing, the Template Pack can help you. You’ll have proven templates to work from so getting better marketing in place takes 10% of the time. Then the Template Pack is going to be perfect for you. Not only will you be able to pick and choose from different template options to get your new venture up and running fast, you’ll know that everything you do is designed from the ground up to succeed. A common approach to marketing is “look at other people and try and reverse engineer what they do.” This only takes you so far, because you don’t know if what they’re doing is actually working. I’ve been highly profitable online for over a decade. I’ll only show you what works. "I need to know what works." The Template Pack will make things much easier for you – from About Pages to taglines, from launch emails to newsletter formats – you’ll find templates that help you put everything together simply, easily, and without the stress. "I’m changing my website / branding." Unless you’re advertising or pouring your life into SEO, traffic comes from two sources – first time visitors deciding to become repeat visitors, and people referring your site to others (on and off of social media). Great blog posts, solid taglines, Start Here pages that convert – that’s how to make it happen. And there are templates for all of those. The key to a good launch is confidence and timing – knowing what to send to your list (and when) - and how to effectively “sell” without pushing too hard. 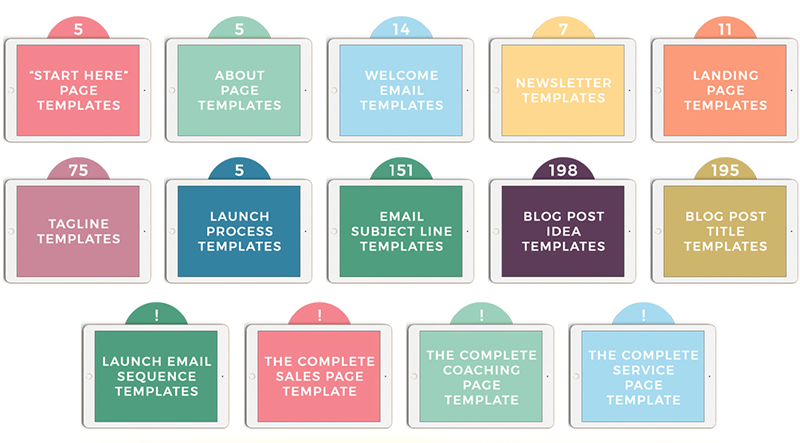 The Template Pack has 5 proven launch sequences (and email templates for every email you’ll send). You’ll have everything you need for a great launch. The most important part of looking pro is having all your marketing pieces in place - and the Template Pack will help you do that quickly and efficiently. The second most important part of looking pro? Well, follow the advice in each of the template packs and you'll know how to position yourself as the expert you are. 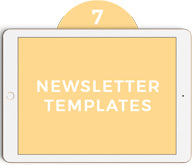 Even when your newsletter isn't promoting a new offer, it can be a powerful marketing tool. The newsletter templates will help you decide what format works best for the marketing objectives most important to you, and the blog post / subject line templates will ensure you have tons of content to send to your list. Hiring copywriters - and marketing coaches - can get expensive, fast. The template packs you'll download are based on the work I've done for clients over the years, so you're getting thousands of dollars of pre-vetted copy and marketing advice for almost nothing. Tight budget? These templates are the answer. So much online marketing advice assumes you’re selling impersonal things to people you don’t actually care about (and therefore, you don’t care if you look pushy, aggressive, or egotistical). These templates are designed to help you sell real things to real people, and you have my promise that they won’t make you look pushy, aggressive, or egotistical at all. Then these templates will be a godsend to you. 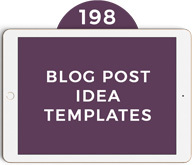 With almost 200 unique, detailed blog post ideas, the same number of copywriting-oriented blog post titles, and 151 email subject lines to choose from, you'll have all the content and email ideas you'll ever need. Clients call you when they take a look at your website, poke around your blog posts, and see About Pages that make them feel like they can connect to you. The Template Pack will give you guidance and options to help you create website content that will get clients emailing and calling you. (And, of course, there are coaching/consulting and service page templates as well!). How much faster would your business grow if you (finally) had better marketing in place? There are a lot of reasons your business isn’t growing as fast as you wish it would. Don’t let gaps in your marketing be part of that. 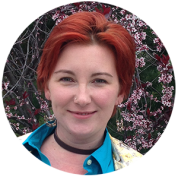 These templates give you an easy, straightforward way to uplevel your marketing without hiring expensive marketing coaches or copywriters. Each of these template packs give you specific instructions on what to do, how to do it (and why it works) – so you can simply plug and play your business details into templates that get results. 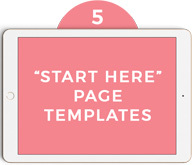 If you want to get your business moving forward faster, these templates can help you do it. But first you have to get these templates in your hands. Click the button below, and you can download them right now. all your marketing ducks in order. You can get The Ultimate Digital Marketing Template Pack right now by clicking the button below. 14 template sets, all designed to get you more traffic, signups and sales than you’re getting now. Then get in touch, and I’ll happily return your entire purchase price. No questions asked. Now go take a look at the Template Pack. I guarantee you’re going to love it. If The Ultimate Digital Marketing Template Pack isn’t the right fit for you, send me an email within 30 days of purchase, and I’ll cheerfully give you your money back. 100%. No hoops to jump through, no worksheets to fill out, no questions asked.